Giant gearless mill drives (GMDs) are used extensively to power grinding mills that crush ore. As mine owners opt to increase productivity at existing mines rather than open new ones, more GMDs can be added to an already-loaded power grid. Under these difficult conditions, ABB’s FACTS ensure grid stability. In the mining industry, several different types of mill are used to grind ore into smaller pieces for further processing: Ball mills consist of a rotating horizontal hollow cylinder, with an abrasion-resistant interior. The grinding is performed by free-moving stone, metal or rubber balls that are lifted to a certain height by natural adhesion to the inside of the cylinder. Autogenous (AG) mills are similar but have internal lifting plates and use large ore particles as the grinding media. If the ore is too hard or abrasive, steel balls may be added – the mill is then called a semi-autogenous (SAG) mill. AG and SAG mills can be used as a one-stage grinder but are often used as the first stage in a two- or multiple-stage grinding process, where the second stage is carried out by the ball mill. 01 Mining companies often opt to expand an existing mine rather than open a new one. ABB FACTS devices allow power-hungry machines such as GMDs to be added without jeopardizing local grid stability. 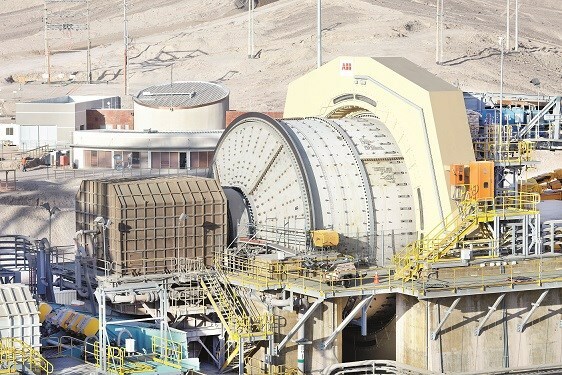 Shown is one of three ABB-installed GMDs at the Esperanza gold and copper mine in Chile. These mills can be driven by induction motors (low-cost but poor efficiency due to gearbox losses), synchronous motors (which are limited in power to around 9 MW per pinion) or gearless motors, the so-called GMDs. GMDs are high-efficiency, variable-speed motors with powers up to 30 MW and are considered the most effective solution for high-power mills, especially when the total cost of ownership is considered. The GMD’s synchronous motor is fed by a cycloconverter, which is a device that converts AC to a lower frequency AC with no intermediate DC link . GMDs have the huge advantage that they eliminate all the mechanical components of a conventional mill drive system, such as the ring-gear, pinion, gearbox, coupling, motor shaft and bearings, thus offering better energy efficiency, superior reliability, increased process availability and longer lifespan→1. The opening and exploitation of a new mine is a complex undertaking. Environmental impact and engineering assessments have to be carried out, and a bewildering array of permissions, licenses, agreements, and authorizations (construction, explosives, etc.) obtained. As a result, mine owners often choose to increase the productivity of existing mines by expansion instead of opening new ones. A typical mine has one or two SAG mills and two to four ball mills; an expansion usually entails adding one more of each type. When adding new mills to an existing mine infrastructure, a paramount consideration is the robustness of the electrical grid - ie, its ability to supply steady voltage and frequency irrespective of load and grid disturbances. Some grids benefit from synchronous generators – which not only satisfy the power demand but also provide voltage and frequency stability – but others do not, leaving the grid vulnerable to voltage and frequency excursions at the slightest perturbation, such as a motor startup or small load variation. Mine grids are usually of this weak type – ie, with low short-circuit power and mainly resistive, with low-ratio reactance/resistance. Moreover, mines are often located in remote areas and at the end of long transmission lines, which makes the power supply even weaker, and more vulnerable and unpredictable. In these weak grids, the active and reactive power consumption of GMDs, generators, lines and transformers lead to voltage drops and poor power quality→2-3. In such situations, voltage stability is a critical consideration in improving power security and reliability . 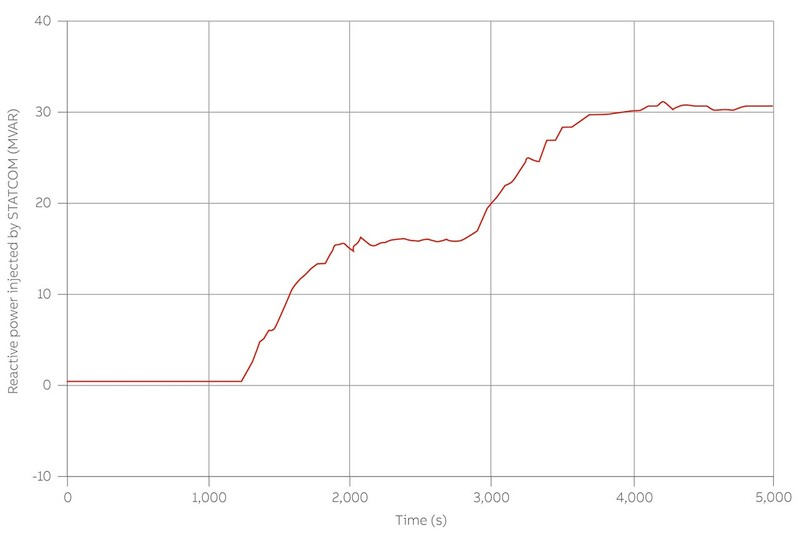 02 Active and reactive power consumed by the startup of a SAG motor at 1,200 s.
03 Nominal voltage drops by about 1.4 percent in different power buses after a new motor startup at 1,200 s.
For shunt compensation, the SVC (static var compensator) and the STATCOM (static compensator) operate as reactive power compensators. For series compensation, the most important devices are the TCSC (thyristor-controlled series compensator) and the SSSC (static synchronous series compensator), which increase or decrease the transfer reactance of the power line at the rated frequency. These devices are installed worldwide in electrical substations, railways, mining complexes, HVDC (high-voltage DC) stations, renewable energy plants, etc. The total power of shunt devices installed worldwide adds up to about 95,000 MVA while that of series compensation devices is around 360,000 MVA. 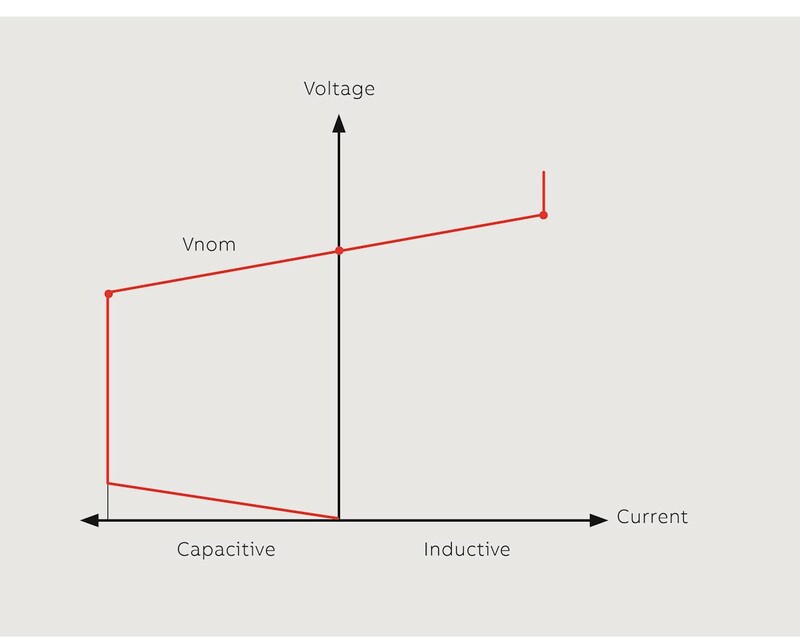 An SVC consists of a combination of thyristor-switched capacitors (TSCs) and thyristor-switched reactors (TSRs) or thyristor-controlled reactors (TCRs) that behaves like a shunt-connected variable reactance. This arrangement either generates or absorbs reactive power in order to regulate the voltage magnitude at the point of connection to the AC network. 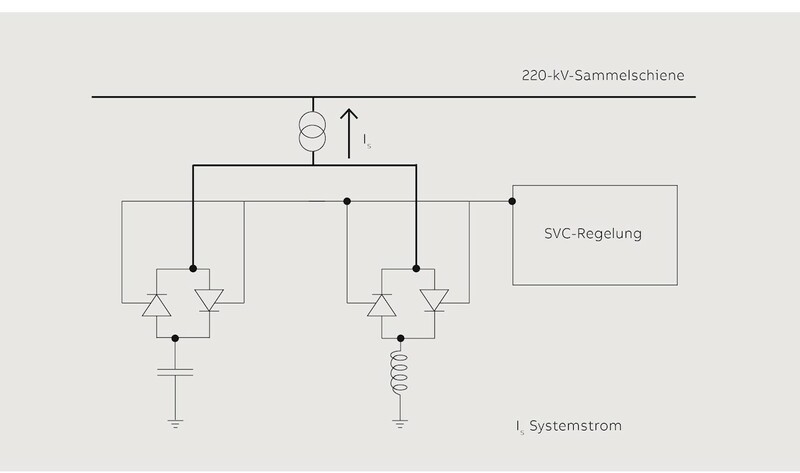 Coordinated control varies the reactive power at the SVC output, thus continuously varying the capacitive and inductive ratings of the system →4-5. 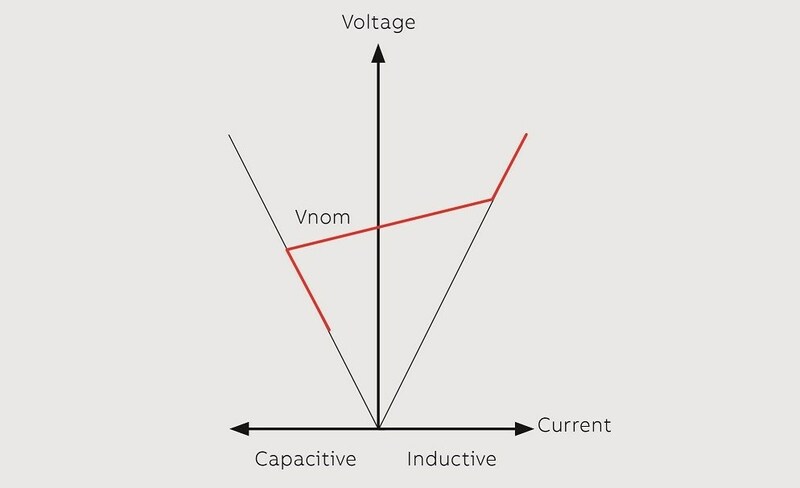 05 The SVC V-I characteristic indicates that regulation with a slope around the nominal voltage (Vnom) can be obtained in the normal operating range defined by the maximum SVC inductive and capacitive currents. These maximum currents depend on the system voltage. A STATCOM is equivalent to a controllable voltage source behind a reactance. 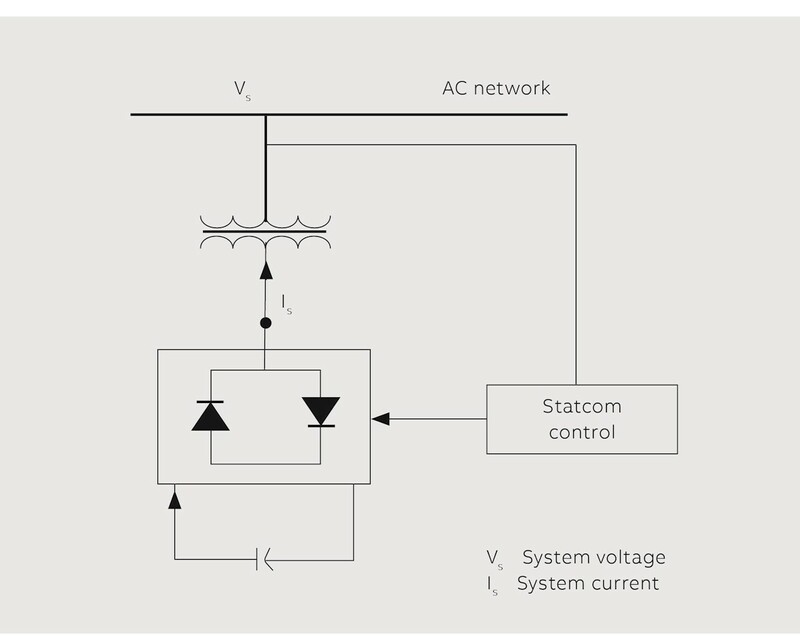 A STATCOM is a shunt-connected reactive compensation device, capable of producing or absorbing reactive power in the capacitive and inductive range to maintain control over specific system electrical parameters→6-7. 07 The STATCON V-I characteristic, which shows that a STATCOM can provide capacitive and inductive current independent of the system voltage. ΔU(%) = percentage of the voltage level to recover, with reference to nominal voltage. Q = Reactive power of the FACTS system. Scc =short-circuit power in the bus in which the FACTS system is placed. Thus, a 40 MVAR STATCOM will be able to recover 4 percent of the nominal voltage in a bus where the short-circuit power is 1,000 MVA. A STATCOM with this rating can control bus voltage and recover any sags caused by, for example, motor starts. 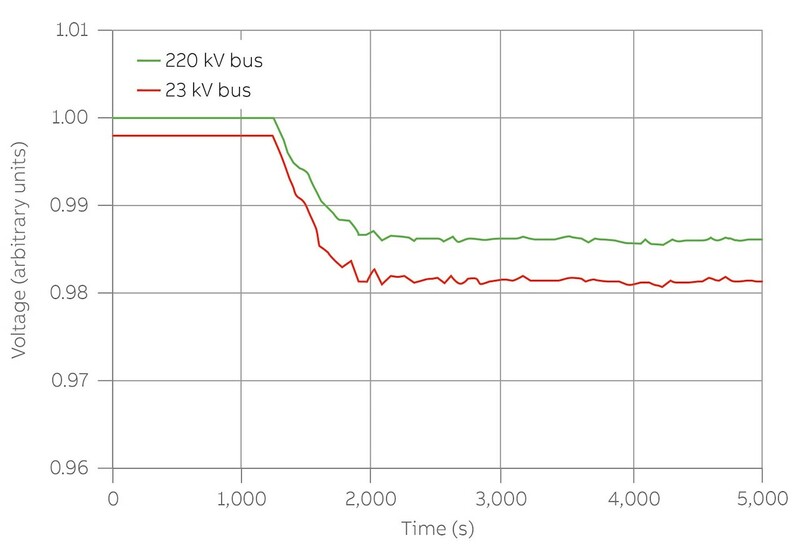 A simulation of bus voltages after the start and nominal operation of new GMDs with a STATCOM (on the 220 kV bus) is shown in→8. At 1,200 s the first motor starts, consuming active and reactive power and inducing a voltage drop of 1.4 percent. STATCOM control reacts to this by injecting reactive power to compensate the 220 kV bus voltage. As a result of this reactive power injection, the 23 kV bus voltage is also compensated, keeping it above 99 percent of nominal voltage. A second motor is switched on at 2,800 s, causing the STATCOM to inject more reactive power to compensate for this new drop. 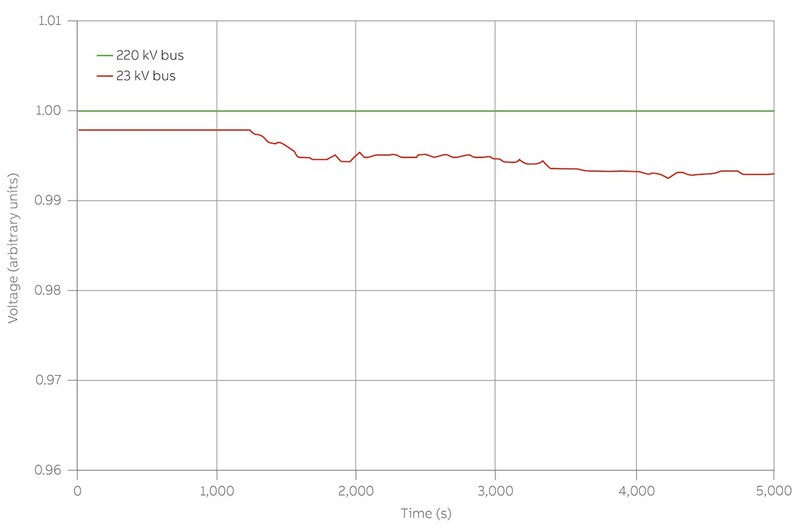 08 Simulation of bus voltages after the start up and nominal operation of new GMDs with a STATCOM on the 220 kV bus. →9 shows the reactive power in MVARs injected by the STATCOM. 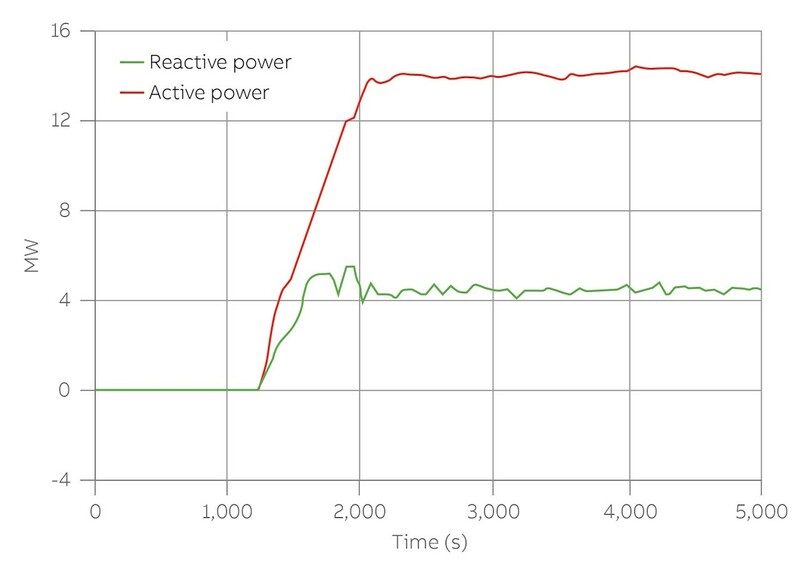 Two reactive power injection events can be discerned: at 1,200 s, when the first GMD starts, and at 2,800 s, when the second GMD motor starts. This reactive power injection stabilizes the system voltage. 09 Reactive power injected by FACTS device. The addition of a further GMD allows mining enterprises to achieve higher production and productivity in an existing location and saves them the huge effort involved in opening up a new mining complex. By taking advantage of ABB’s FACTS products, new GMDs and associated equipment can be smoothly integrated into the local power grid without weakening it. Indeed, already weak grids will be strengthened by the addition of, for example, SVC or STATCOM devices. A. Symonds, M. Laylabadi, “Cycloconverter Drives in Mining Applications,” IEEE Industry Applications magazine Nov/Dec 2015. J. Pontt, et al., “Current issues on high-power cycloconverter -fed gearless motor drives for grinding mills,” IEEE International Symposium on Industrial Electronics, 2003. N. G. Hingorani, L. Gyugyi,”Understanding FACTS: concepts and technology of flexible AC transmission systems,” Wiley-IEEE Press, 1999. K. B. Bimal, “Power Electronics and Motor Drives: Advances and Trends,” p. 126, Academic Press, 2006.